Today however we can put all that behind us as Intel are releasing their latest High End Desktop platform. Featuring an all new CPU architecture and motherboard chipset, Haswell-E and X99 looks set to bring a new era to the high end market. And in our first review we're bringing you the cream of the crop: Intel's flagship Core i7-5960X Extreme Edition. For the first time with Intel's High End Desktop platform you're getting eight (yes, eight) physical cores each supporting hyperthreading in a package which is fully unlocked for overclocking (with few limits on multiplier and BCLK adjustment). In order to retain a sensible 140W TDP envolope Intel's Base clocks for the i7-5960X are relatively conservative at 3 GHz, but an aggressive Turbo mode allows it to clock up to 3.5GHz by selectively ramping up a limited number of cores. Even so, enthusiasts will of course be looking forward to really pushing the new CPU as far as it can. Just as noteworthy as the increased core count is the debut of quad-channel DDR4 support on any desktop platform. The new RAM specification allows for a more dense package, lower operating voltages and higher overall bandwidth than DDR3 i.e. more efficient and higher performance computing. The DIMMs are of course debuting with this release so you have to factor the price into your overall purchase. Thankfully the CPU cooler mounting system is identical; presupposing an existing high-end solution there's no need to invest still further in this regard. 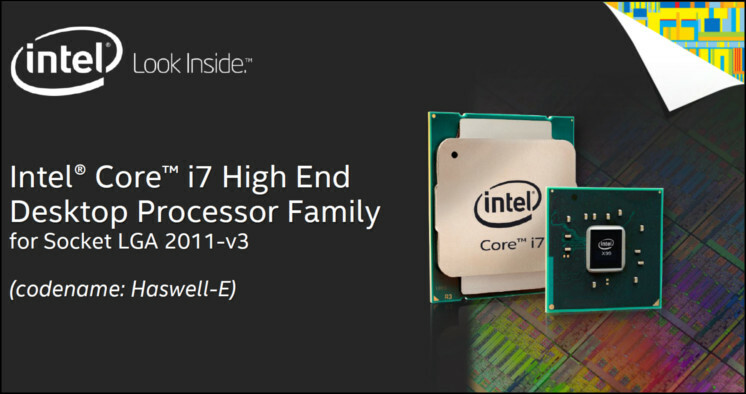 The Core i7-5960X EE is the halo product, but we should also note that two additional CPUs are rounding out the Haswell-E launch. The Core i7-5930K has two fewer CPU cores, less L3 Cache and relatively high base and Turbo clocks to compensate. An entry-level Core i7-5820K by contrast retains six cores/12 threads but supplies only 28 PCI Express 3.0 lanes. Unlike previous Intel HED therefore there's plenty of differentiation between the SKUs as well as a $600 gap in price. So there are the basics of the Core i7-5960X Extreme Edition, but we have deeper to delve before we move on to testing.